Sea-Tac Airport's Central Terminal, designed by Fentress Bradburn Architects of Denver is really quite impressive. The standout feature is easily the 60-by-350-foot glass wall that offers a spectacular view of departing and arriving flights. The panes compose a compound curve, convex in the vertical plane and concave in the horizontal. 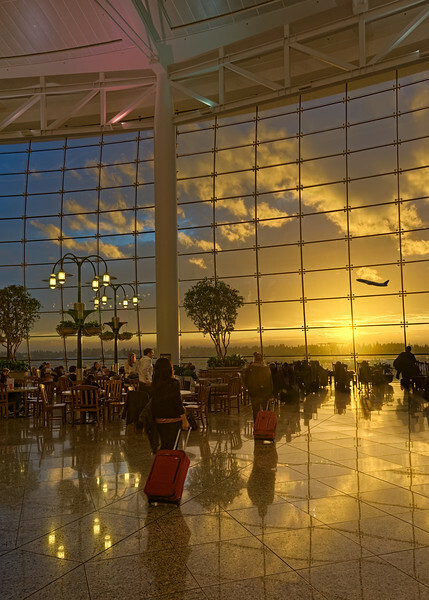 I can also add that the window is ideal for sunset viewing on a long layover! Image Notes: manually blended two frames to expand dynamic range. Once again luminosity masking to the rescue, this was a challenging blend.